Like mentioned by Rishako and Chisato, Chisato's most charming feature are definitely her eyes. They literally go "^_^" whenever she smiles. I love to see her sparkling eyes when she smiled. Her voice is really good. I hope she will get more solo line in the next single.
. myspace . blog . last.fm . I would agree, Airi's vocal abilities seem to have gone down a few notches since she was younger so Chisato got little competition if she reaches her full potential. Was praying to a wide assortment of gods for her to get a solo on the mini but I doubt she'll get a lead unless the band sees two more graduations. Apparently she's not pretty enough to be up front, or so everyone (non chisato fans obviously) tells me. Good thing we know better. Chisato now > Airi now. Aa! 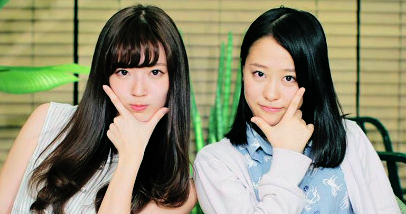 Airi >>>> Alll H!P Kids. 'nuff said. To me, Chisato has the best voice in C-ute next to Airi. Too bad Tsunku doesn't put her up front more often. C'mon Tsunku, give her a solo on the next album! Happy 13th Birthday, the sunshine of C-ute! Here's hoping it's an excellent one! Listened to her singing Ukare mode, so good! Wow she's a teenager already! when is she gonna release her cover of Romantic Ukare Mode? Please keep up with futsal, I like you plying it.